The heart's outer surface is the epicardium. 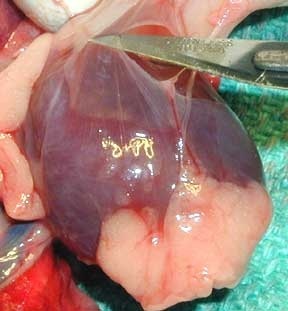 The epicardium is a serous membrane that consists of an external layer of simple squamous and an inner layer of areolar tissue. The squamous cells secrete lubricating fluids into teh pericardial cavity. Covering the inner surface of the heart wall is the endocardium. This layer also covers the heart valves and tendons and is continuous with the endothelium that lines the major blood vessels that attach to the heart. The endocardium is made up of thin layers of simple squamous cells and areolar tissue, similar to the epicardium. Secretions from the squamous cells help regulate the activity of the myocardium.